Pavo cristatus (Peacock) is the national bird of India. It consists of typical quill feather (helpful in flying) which can be used to prepare Mayūrapuccha Bhasma (Calx of peacock feather). It is widely used in Ayurveda to treat diseases like vomiting, hiccough, respiratory disorder etc. Classical texts such as Siddhayogasangraha and Bhaisajya saṁhitā mention distinct procedures for the preparation of Mayūrapuccha Bhasma. In Siddhayogasaṅgraha, we find in detail, the method of burning the peacock feathers on ghee flame whereas Bhaiṣajya saṁhitā suggests application of four Gajapuṭas (burning the peacock feathers at about 1000°C four times in various media by using a thousand cow dung cakes) to get the Mayūrapuccha Bhasma. Both the preparations are simple and require minimum and easily available ingredients. Neither research on preparation of Mayūrapuccha Bhasma using methods mentioned in classics nor a pharmacopeial standard on it has been attempted, this study is intended to fill this lacunae. Assessing the physico-chemical components of Mayūrapuccha Bhasma (Calx of peacock feather) prepared by ghee flame method and Gajapuṭa (burning the peacock feathers at about 1000°C by using a thousand cow dung cakes) method. Laying down the pharmacopeial standards for the assessment of standard qualities of Mayūrapuccha Bhasma (Calx of peacock feather). A two- part methodology was used. 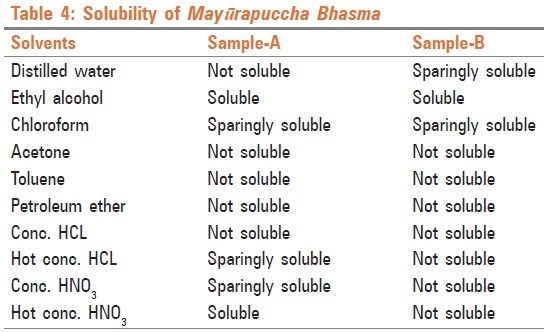 Pharmaceutical part: Preparation of Mayūrapuccha Bhasma by two different classical methods. Gajapuṭa method (burning the peacock feathers at about 1000oC by using a thousand cow dung cakes). Analytical part: Subjecting both the samples to physico- chemical analysis. Peacock feathers, herbal drugs, and other materials required for the purpose were collected and used only after obtaining authentication for pharmaceutical preparation, by experts from the department of Rasashastra and Dravyaguna. Ghee Flame Method: Peacock feathers, ghee. Gajapuṭa Method: Peacock feathers, Palāśamūla (Butea monosperma) Kvātha (decoction), Droṇapuṣpi (Leucas cephalotes spreng) Svarasa (juice), and Cakramarda (Cassiatora) svarasa (juice). Ghee Flame Method (burning peacock feathers on ghee flame): Peacock feathers were burnt on ghee flame and the ash so obtained was triturated in khalva yantra (mortar and pestle) until it got converted into a black powder. The powder was then collected and preserved in an air tight glass container. Gajapuṭa Method (burning the peacock feathers at about 1000°C by using a thousand cow dung cakes): Peacock feathers were cut into small pieces, kept in sharava samputa (sealed in earthen crucibles) and subjected to Gajapuṭa using a thousand cow dung cakes. After allowing the crucibles to cool by themselves, they were separated and a black powder was collected. The powder was then triturated with Palāśamūla Kvātha (decoction of Butea monosperma) and when the mixture attained proper consistency, cakrikas (pellets) were made and dried in the shade. They were then transferred to sharava samputa (sealed in earthen crucibles) and subjected to Gajapuṭa using a thousand cow dung cakes. The same procedure was once again repeated with Droṇapuṣpi svarasa (juice of Leucas cephalotes spreng) and Cakramarda svarasa (juice of cassiatora), respectively. After each trituration one Gajapuṭa was applied. In this manner, a total four Gajapuṭas were applied to get a brownish black coloured Mayūrapuccha Bhasma. The collection of samples is given in [Table 1]. Pharmaceutical observations were carried out for both sample A and B. The observations and results are given in [Table 2]. Sample A and B were evaluated for physico-chemical properties by using standard methods like solubility test, ash value, pH value, specific gravity, moisture content, preliminary organic analysis, gravimetric analysis etc., The samples thus obtained passed Bhasma parīkṣās (tests for properly prepared calx) specifically the dadhi parīkṣā (curd test). For the curd test, a pinch of Mayūrapuccha Bhasma was sprinkled on curd kept in an earthen vessel and the same was observed for change of colour in the curd. The curd exhibited no change in color. Physico-chemical analyses were carried out for both sample A and B. The observations and results are given in [Table 3], [Table 4], [Table 5], [Table 6] and [Table 7]. Sample A and B were subjected for solubility test with different solvents given in [Table 4]. Sample A and B were subjected to quantitative estimation for inorganic elements. 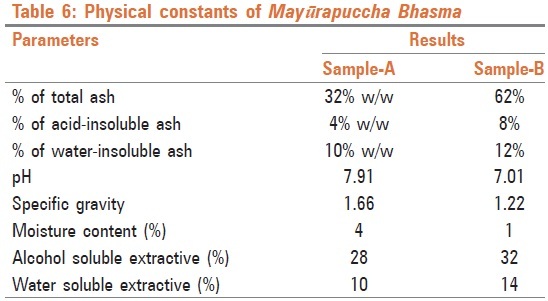 Mayūrapuccha Bhasma (Calx of peacock feather) was prepared by two different methods and both the samples were subjected to organoleptic and physical constants study. The observations revealed that sample A has an unpleasant odor; it is soft to touch; it is tasteless and has a black amorphous powder appearance. Sample B appears as brownish black (due to bhavana dravyas used) micro fine powder form (due to four Gajapuṭas - burning the peacock feathers at about 1000oC by using a thousand cow dung cakes). The pH value of sample A and B were 7.91 and 7.01 respectively. Hence, Mayūrapuccha Bhasma prepared by two separate methods does not have much difference in their pH values. Moisture content of sample A and sample B were 4% and 1%, respectively. It was found to be less in sample B because it was prepared by applying four Gajapuṭas (burning the peacock feathers at about 1000oC by using a thousand cow dung cakes). Organic compounds were absent in sample A and sample B because at the time of preparation of Mayūrapuccha Bhasma (Calx of peacock feather) peacock feathers were burnt at about 100oC in sample A and at about 1000oC in sample B, which may lead to burning of organic components. In sample A, presence of saponins and flavonoids are due to burning peacock feathers on ghee flame. Sample B has less moisture (1%) content which may contribute to an increase of its stability. The pH value of sample A and B was neutral. The pH value of sample A and B indicates no significant difference. As sample B has larger percentage of ash, it consists of inorganic elements in higher quantity and indicates that the Bhasma was prepared properly. Sample B contains copper, iron, zinc, sodium, potassium, calcium, magnesium, manganese, aluminium in larger quantity than sample A, but in a permissible amount, which is essential and beneficial to human body. Mayūrapuccha Bhasma (Calx of peacock feather) prepared by Gajapuṭa method contains essential and beneficial elements, such as saponins, flavonoids, electrolytes in larger quantity with natural pH. We profusely thank Pharmacology Department of B.L.D.E Pharmacy College for helping us with facilities to carry out this work. 1. Lakshmipatishastri. Chardi nidhanam. In: Brahmashankar S, editor. Yoga Ratnakar. Purvardha. 8 th ed. Varanasi: Chaukhambha Sanskrit Samsthana; 2004. p. 453. 2. Yadavaji TA. Vamanaadhikara. In: Siddhayogasangraha. 13 th ed. Allahabad: Byaidyanatha Ayurveda Bhavan Limited; 2008. p. 45. 3. Bhaishajya Samhita (Ayurvedic Pharmacopoeia). Bhasma Prakarana. 1 st ed. Ahmadabad: Ministry of Health Gujarat; 1966. p. 391. 4. Indian Pharmacopeia. Chemical tests and assay appendix-3. vol. 1 and 2., 1 st ed. New Delhi: Ministry of Health and Family Welfare, Government of India; 1985. p. A-74, A-118. 5. Carl AB, Edward RA. Chemical tests and assay. Teitz's Text Book of Clinical Chemistry. 2 nd ed. London: W. B. Saunders Company; 1994. p. 206,2059,1324,1339,1905,1357. 6. John HB. Essential and Trace Ions. 1 st ed. Bombay: Varganesh Publishing House; 1986. p. 213-40, 277. 7. Mathur DS. Chardhirogakarmavipaka. Bruhat Nighantu Ratnakar. vol. 5, 1 st ed. Mumbai: Khemraj Shrikrishnadass Publishers; 2011. p. 326. 8. Bhavamishra, Guduchyadi Varga, Vatadi Varga. In: Chunekar KC, editor. Bhavaprakasha Nighantu. 6 th ed. Varanasi: Chaukhambha Bharati Academy; 2004. p. 125-6,463-4,536-7. 9. Vaidya SS, Dhole VA. Mashi Kalpa. In: Bhaishajya Kalpana, editor. 4 th ed. Pune: Anmol Prakashan; 1994. p. 96.